Citation SELAGINELLA ARMATA Baker, var. 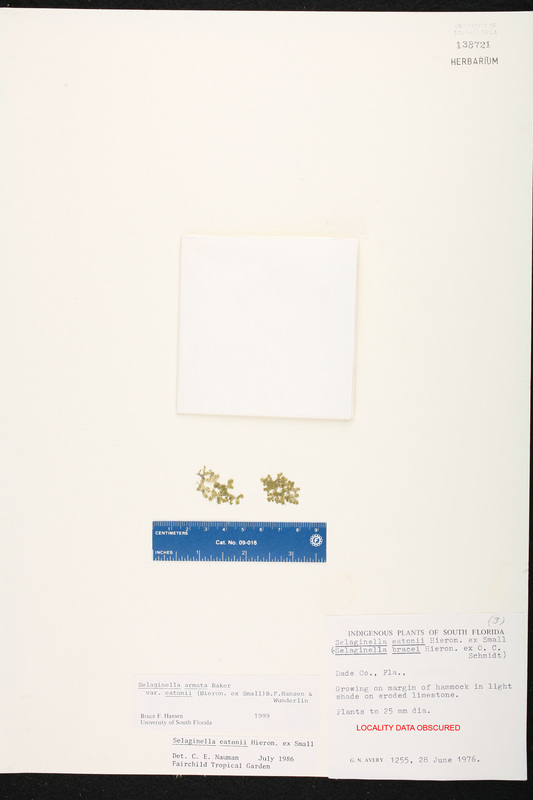 EATONII (Hieronymus ex Small) B. F. Hansen & Wunderlin, Phytologia 85: 300. 2000 ("1998"). 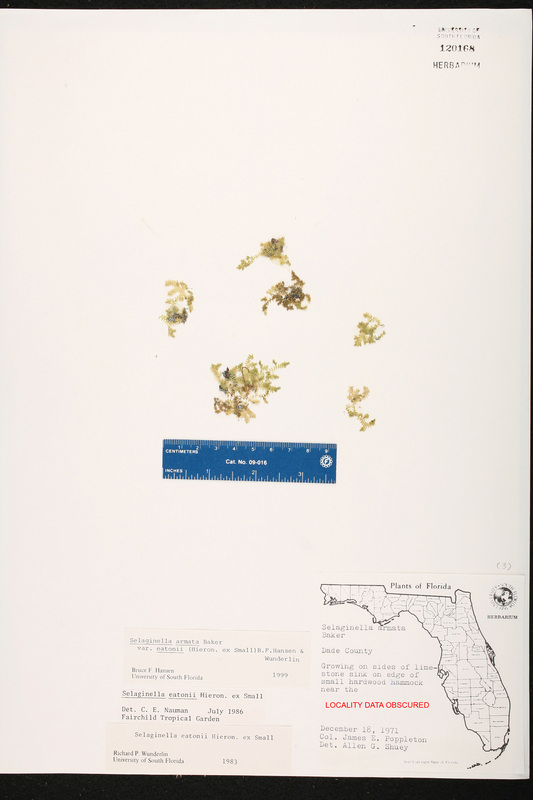 Basionym: Selaginella eatonii Hieronymus ex Small 1918. Type: FLORIDA: Miami-Dade Co.: About lime-sinks, border of Everglades, Black Point Creek, 13 Nov 1913, Eaton 265 (lectotype: NY; isotypes: US, USF). Lectotypified by Buck, Amer. Fern J. 68: 34. 1978. Diplostachyum eatonii Diplostachyum eatonii (Hieronymus ex Small) Small, Ferns S.E. States 422. 1938. 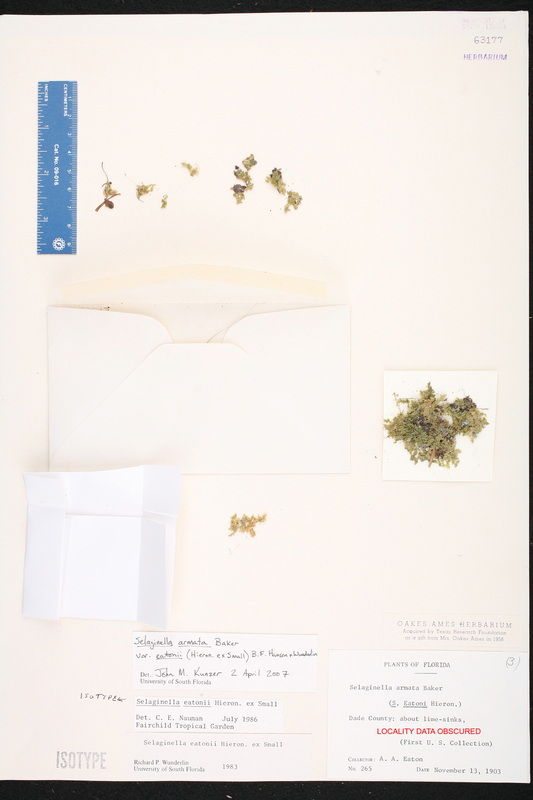 BASIONYM: Selaginella eatonii Hieronymus ex Small 1918. Selaginella bracei Selaginella bracei Hieronymus ex O. C. Schmidt, Repert. Spec. Nov. Regni Veg. 20: 156. 1924. TYPE: BAHAMA ISLANDS: Great Abaco Island: Marsh Harbour, 21 Dec 1904, Brace 1834 (lectotype: NY). Lectotypified by W. R. Buck, Amer. Fern J. 68: 34. 1978. Selaginella eatonii Selaginella eatonii Hieronymus ex Small, Ferns Trop. Florida 67. 1918. FLORIDA: Miami-Dade Co.: About lime-sinks, border of Everglades, Black Point Creek, 13 Nov 1913, Eaton 265 (lectotype: NY; isolectotypes: US, USF). Lectotypified by Buck, Amer. Fern J. 68: 34. 1978.